A heralded writer of epic fantasy, Robin Hobb has given readers worlds within worlds in her heroic Farseer and Liveship Traders trilogies. Now she takes the final step in the breathtaking trilogy of the Tawny Man, as the tale of FitzChivalry Farseer comes to an epic end. 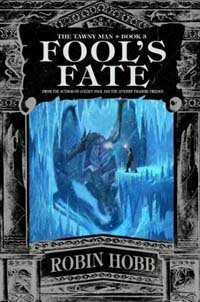 Rife with boundless adventure and unforgettable characters, Fool’s Fate is destined to become a classic of the genre. Dutiful, his assassin-mentor Chade, and the simpleminded yet strongly Skilled Thick, FitzChivalry strives to aid the prince on a quest that could ultimately secure peace between the Six Duchies and the Outislands—and win Dutiful the hand of the Narcheska Elliania. legendary defender. Are there darker forces at work behind the Narcheska’s imperious demand? As the prince and his coterie set sail, FitzChivalry works behind the scenes, playing nursemaid to the ailing Thick, while striving to strengthen their Skill—ultimately bringing his unacknowledged daughter into the web of the Skill magic, where the truth must finally unfold.